Last week, I've spent four days in the southern-most city in Israel, Eilat, covering the Fed Cup Europe/Africa Zone Group I tournament together with Israel Tennis Results. This has been a great experience, and I'd like to thank the ITR guys for the opportunity to go to the tournament as media. You can find all the press conferences, interviews, and other videos from the weekend on the Israel Tennis Results Youtube channel, and all the photos that I took on the blog's Facebook page. The full results can be found on the Fed Cup official website. Here, I'll cover some general tournament-related topics at first, and then sum up my impression of the teams I've had a chance to watch. Eilat is a desert city on the shores of the Red Sea. As such, it rarely has rain, even during the winter, which makes her perfect for hosting a tennis tournament in February. Of course, the Tennis Gods are cruel, and half an hour before play was supposed to start, a storm of biblical proportions washed the city. Or not so biblical - but in Eilat, 3 hours of steady rain were enough to flood the street and cause an airport closure for half a day. The courts got dry by the time the afternoon matches were scheduled to start, but the tight format of the tournament meant that all the morning matches were moved a day forward, and half of the teams had to stay an extra day and play on Sunday morning. The rest of the weekend was sunny and warm, and even the evenings had pleasant weather. The main problem that came up in many of the matches was dodgy line calling. There were many disputes between players and line judges, a fair share of cases where the chair umpire made the call instead of the linesmen, and quite a few corrections. The players, obviously, weren't thrilled with that development, but everyone suffered equally from it. Compared to the original list of players, the actual roster of the tie was much weaker than expected. With Azarenka and Paszek not playing for scheduling reasons (with Doha coming up two days after Fed Cup), and many other players withdrawing with various injuries (Govortsova, Halep, Begu, Koehler, Martic, Bertens, Hercog), some of the pools became very unbalanced (Croatia easily defeating Austria, Belarus and Georgia is a good example of that). This, unfortunately, is a point that needs to be made every time a Davis/Fed Cup event is hosted by Israel, but I'd like to make it perfectly clear. Like I said after last year's Fed Cup, the crowd that comes to Eilat for tennis is mostly a tennis loving and knowledgeable one. The others are local residents, and since Eilat is a small town, there are not many of those. That means that even during Israel's matches, the crowd is generally respectful towards the opposing players. Yes, there's always the occasional heckler, and sometimes large groups of kids aren't as silent as one would like, but overall - the crowd's behaviour is not different than in any large tournament (Roland Garros comes to mind). And now, some comments about the main teams that I've watched over the extended weekend. Portugal suffered from the withdrawal of their highest ranked player, Maria João Koehler, with Michelle Larcher De Brito playing as the #1 player and in doubles, as well. De Brito did very well under the circumstances, winning 2 out of her 3 singles matches in Pool B. She started the week by losing to Timea Babos 6-3 5-7 5-7 in an extremely tight and emotional match. She was playing well until the end of the second set, but then hit three double faults in one game while serving to stay in the set. That unhinged her mentally for a while, and she was close to tears in the start of the third set, but she collected herself and played evenly enough for the rest of the match. However, the match was partially decided by a questionable line call, that brought up match point for Hungary. De Brito played well in her 6-1 6-4 win against Heather Watson, being the steadier player throughout the match, but that form wasn't enough to get a doubles win versus the Brits. She did, however, win both her singles and doubles matches against Bosnia and Herzegovina, bringing the crucial point that prevented Portugal from having to play the elimination tie. It's not a secret that Shahar Peer has had a pretty awful 2012, and 2013 didn't start much better (1-3 win-loss record before this Fed Cup). During the off-season she returned to work with Pablo Giacopelli, who's credited for getting her up the rankings back around 2010. I was skeptical about the effect this had on Peer's game, but was pleasantly surprised to see her this week. She's been hitting much flatter and more aggressively than for most of 2011-2012, with purpose to her shots and without the unnecessary moonballs. Granted, she was still on the verge of losing to Turkish #163 Cagla Buyukakcay (won 1-6 6-1 7-6(3)), and couldn't hold to a 4-0 lead in the second set against Sorana Cirstea (lost 2-6 6-7(4)), but there's no doubt that she's making progress. Meanwhile, Julia Glushko won all four of her singles matches, including a 6-4 6-4 win over Urszula Radwanska - the biggest win of her career so far. Like Amir Weintraub, Glushko seems to thrive with home support, and despite still being overly emotional and occasionally irritable on court, she had a great week in singles. Israel's problem, as always, is the doubles - Peer is a good doubles player (fresh from a semifinal showing in Pattaya), but Glushko has no idea what to do at the net, and Peer had to manage her throughout their match with Poland. In an unexpected turn of events, that match was very decisive, with the winner proceeding to the promotion tie against Croatia. Israel led by a set, and made a mini-comeback in the second set, with the third being very tight, but ultimately it wasn't enough. The new captain, Amos Mansdorf, who on the first day decided in the last moment to conserve Peer's and Glushko's efforts and not play them in doubles, said himself that he might have made the wrong decision, when on the second day they lost meekly to the Romanians. In retrospect, that might have been the match they needed to get used to playing together. Still, being one set away from the promotion tie is a much better result than anything the team was expected to achieve when the draw came out, despite the obvious disappointment with losing the crucial doubles match. Croatia was the team that piqued my interest since the moment the player lists came out. I wanted to chat with Donna Vekic (ranked #92 as a 16 year old) and Ana Konjuh (Junior AO singles + doubles champion; surname pronounced "Kon-yoo-ch") from the start, but the tight schedule and Croatia playing in parallel to Israel made the timing very difficult, and the long doubles match between Poland and Israel eventually prevented that interview from happening. Mostly, my opinion about Great Britain haven't changed much from last year - this is an excellent team, especially since they have the best team atmosphere by far. This, in my opinion, makes a lot of difference in tight situations (compare to Poland and U. Radwanska, but more on that later). Poland is another team that for me, just confirmed what I wrote about them last year. On paper, they were for sure the best team out of the 16 participants, as is evident by their eventual 4-0 result during the week. However, the team dynamics is Poland's biggest problem. It's tough to say what exactly is going on inside the team, but I can share what I saw: there's hardly any internal support on the team during their matches. Only on the last day I've actually seen Wiktorowski (team captain, and Aga's coach) trying to cheer for his players - most of the time he's just sitting there, and the other team members don't do much cheering either. Agnieszka wasn't even watching any of Urszula's match on the last day of the competition. This might sound like an insignificant issue, but it's a stark contrast to most other teams (the Turkish team was on their feet each time their player was leading in the match against Israel, for example). As a result, whenever Ula lost her singles match, Aga came to play in a fairly bad mood, which also affected their doubles play. During the doubles match against Israel, Aga practically lashed out at her younger sister, and seemed to berate her instead of showing support (which is expected from a doubles partner). All of that, I believe, is part of the cause for the 'main' story of the week - Poland's non-existent press conference after their win over Israel. I've seen many people express their opinion about the matter, without knowing the facts, so I'd like to set the record straight. The Polish team wasn't mad at the Israeli crowd - they didn't want to give a press conference even before the tie itself, from the beginning of the week. The crowd wasn't out of order during that match, and had a lot of appreciation for A. Radwanska's finer shots. The question that you hear in the video about the Israeli crowd was a question we prepared in advance, before the tie was even played, since we knew that Poland complained about the Israeli crowd in 2011. It was one of several questions that we had in mind to ask, and we gave up on the others when we saw the Polish attitude during the 'press conference'. Now, don't get me wrong - I sincerely appreciate the fact that A. Radwanska has consistently shown up to the zonal tie for three years in a row, trying to get promoted to World Group II where they belong. I understand that the tournament might not be in the same standard as what Radwanska is used to. Still, the attitude is, in my eyes, disappointing. In the end, Poland beat Croatia on a Konjuh double fault in the doubles match, after which the team finally allowed themselves to relax and celebrate. Great Britain and Poland, the early favourites to achieve promotion, were indeed the ones to go on to World Group II play-offs. Georgia and Bosnia-Herzegovina, easily the weakest teams, were relegated to Zone Group II. 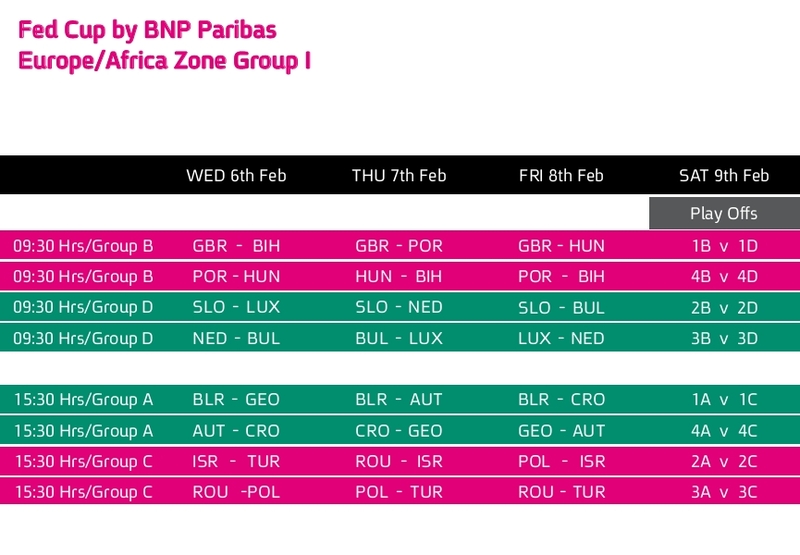 With Israel staying in the group, local tennis fans will hope that they will host the Fed Cup Zone Group I ties once again next year. See you in Eilat 2014?